A new analysis of two ancient Egyptian mummies has uncovered the earliest known examples of “figural” tattoos on human beings—that is, tattoos that are meant to represent a real things, rather than abstract symbols. What’s more, at around 5,000 years old, it’s the earliest evidence of tattoos on a woman. The two mummies, one female and one male, have been on display at the British Museum for decades. They were discovered about 100 years ago in Gebelein, which is about 25 miles (40 km) south of Luxor, Egypt. The bodies—dubbed “Gebelein Woman” and “Gebelin Man A”—were found buried in a shallow grave, and without any special treatments; the desert’s dryness, salinity, and heat prevented the bodies from decaying, which is why they were found in such remarkably good condition. The mummies were dated to between 3351 and 3017 BC—the Predynastic period of ancient Egypt, a time before the first pharaoh unified the fledgling nation. Under normal lighting, faint markings were visible on both mummies, but scientists didn’t think much of them, assuming they were unimportant. Daniel Antoine, curator of physical anthropology at the British Museum, along with his colleagues from Oxford University and the Max Planck Institute for Evolutionary Anthropology, decided to take a closer look at these markings using the latest scientific techniques, including CT scanning, radiocarbon dating, and infrared imaging. 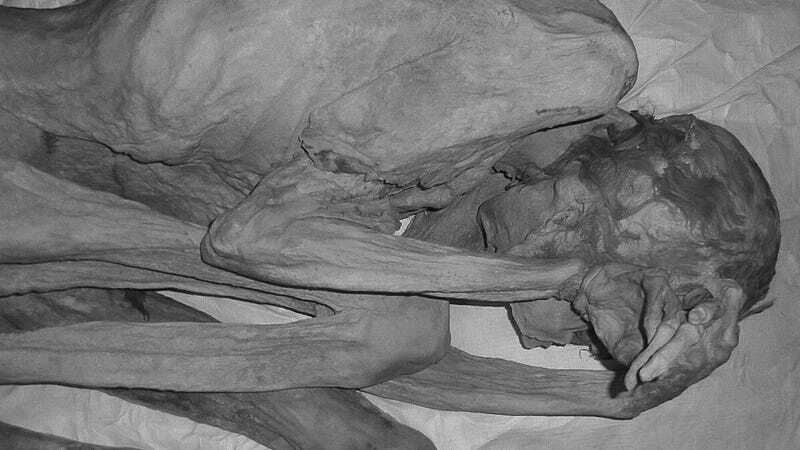 The resulting analysis, now published in the Journal of Archaeological Science, changes what we know of these mummies and the era in which they lived. The markings on these mummies are now the oldest evidence of figural tattoos on humans. These weren’t just etchings made on the skin—they were actual representations, or drawings, of physical objects. Gebelin Man A had tattoos of what appears to be a wild bull and a sheep, while Gebelein Woman had staff-like and S-shaped motifs on her upper arm and shoulder. The tattoos may have indicated status or bravery, or they may have held spiritual importance, like an indication of special knowledge or protective powers. The discovery also shows that tattooing was practiced by both sexes at the time. The carbon-based pigment, perhaps soot, was applied to the dermis layer of the skin. The ‘S’ motif found on Gebelein Woman. The stick-shaped tattoo on the right arm of Gebelein Woman. Using infrared photography, the researchers identified a series of four small ‘S’ shaped motifs running vertically across Gebelein Woman’s right shoulder. This motif was quite common during this era, appearing on Predynastic pottery and always in multiples. The linear motif on her right arm bears a striking resemblance to objects seen in painted ceramics of the same period, in which individuals hold onto objects while engaging in ceremonial activities. The crooked stave could be a symbol of power and status, a throwing stick, or a baton used in ritual dances. They’re the earliest known examples of tattoos on a female in the paleoarchaeological record. Top: Infrared image of Gebelein Man A. 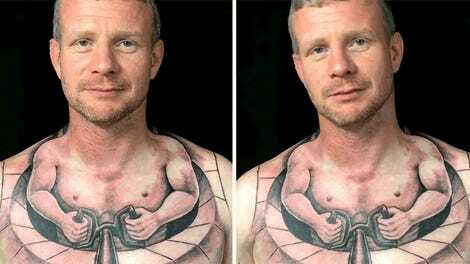 Lower left: tattoos seen on his right arm under infrared light. Lower right: The mummy and tattoos under normal lighting conditions. Previous CT scans showed that the male was between the age of 18 and 21 when he died, and that he was killed by a stab wound to the back. The researchers were able to discern his markings as being tattoos of slightly overlapping horned animals—likely a wild bull with its long tail and elaborate horns, and a Barbary sheep with its curving horns and slumped shoulder. Both animals were common in Egypt at the time. These tattoos are the oldest figural tattoos ever discovered, and they existed at roughly the same period of time as the other oldest known tattoos—the ones on Ötzi the Iceman, who lived some time between 3370 and 3100 BC. Ötzi, whose remarkably well-preserved remains were found in the 1990s in the Tyrolean Alps of Europe, had vertical and horizontal markings rather than the fancy renderings found on the Egyptian mummies. Most of Ötzi’s 61 documented tattoos were located near his joints, and may have been applied as a kind of therapeutic medical treatment.